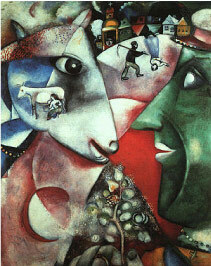 Marc Chagall was born in Belarus on July 7, 1887 to Feige-Ite and Khatskl (Zakhar) Shagal who was a herring merchant. Marc was the oldest of nine children from a loving Jewish family. His childhood was a happy one and images from that period of his life appear throughout his work. As a youg boy he learned about art in Saint Petersburg, Russia. In 1910 he traveled to Paris to continue his studies. He remained there until 1914. In 1914, he returned home. One year later he married his fiancée, Bella Rosenfeld. In 1916 the Chagall's gave birth to their first child; a daughter they named Ida. In 1930, Chagall was asked to create a series of Bible prints that would illustrate scenes from the Old Testament. By 1939 he had completed 66 of the prints. He returned to finish the project 13 years later. In 1937 Chagall became a French citizen. But four years later the Chagall's fled to the United States because of the Nazi's occupation of France during World War II. 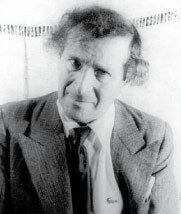 Chagall lived in the U.S. until 1948. In his later years Chagall created a series of large projects for civic building and churches. For St. Stephan's church in Germany he created a set of nine glowing blue stained glass windows depicting stories from the New Testament. These windows were intended to be part of an effort to rebuild relationships between the Jewish and German people. His project was particularly important to him as he had fled Nazi's occupied France several decades before. Marc Chagall died in St. Paul de Vence, France, on March 28, 1985. He is best remembered for his I and the Village, painted in 1911. His unique artistic career included paintings, book illustrations, stained glass windows, stage sets, ceramics and tapestries. Each work is full of life with haunting and poetic beauty. I and the Village is a painting of the birth place of the artist. The dream-like images include a green-faced man wearing a hat, a goat being milked on the face of a goat, a glowing tree, and a collection of houses in the background.